In April 2010 pictures popped up on Chris Seward's flickr account showing a bunch of motorcycles abandoned in a warehouse. Internet rumors and guesses as to where the building was located flooded the motorcycle blogs. At some point the location was discovered or someone told. The topic showed up on a local sport bike forum I read and I was hooked. My friends and I talked about riding to New York and looking for the building, getting in somehow and taking pictures. A few weeks later the date was picked and a few friends were invited. Most of the invited couldn’t make it but my friend Salva was all about it. We left my house Friday September 17 2010 and rode our sport bikes 9 hours north to Lockport New York. The next morning we checked out of our motel and headed to downtown Lockport. Lockport is a pretty neat little town. The Erie Canal runs through the city and there is a canal lock right in the city. The building with the alleged motorcycles is within eye sight of the canal lock. We hung out by the lock for a little while watching boats being raised and lowered. I was getting a feel for the area and casing the building like a bank robber. We made our way over to the building trying to be as inconspicuous as possible. Train tracks run parallel with the building so we walked down the tracks towards the bridge that crosses the Erie Canal. There was a trail just before the bridge that went to the back of the building that we wanted to get into. The building was actually three buildings linked together. We had to walk through buildings three and two in order to get to building one where the motorcycles were but at that time I didn’t know where the motorcycles were or if they were even in there. The buildings are trashed, stuff is everywhere. We didn’t know if there were homeless people in the building, kids in there messing around, or if the owner of the motorcycles was in there or would come at anytime so we went slowly. There were small hints that there were motorcycles in there with a gas tank here and a beat up motorcycle frame there. The door to the building that had the motorcycles was open a few inches and I could see a motorcycle leaning against the wall. I opened the door slowly and went in. This was the basement of the building, it was damp, musty and very dark and of course I didn’t have a flashlight. I used the flash on my camera to see in the darkest areas. The basement was full of old rusty bikes that nearly rusted away from the moisture in the air. There was a set up stairs that looked like they were just days from crumbling. I lightly walked upstairs and opened the door and that’s where my jaw dropped. The room was full of motorcycles. There were holes on the main floor with motorcycles falling into the basement and there were motorcycles on the third floor falling onto the main floor. Half of the main floor was concrete and very stable so we wondered around and tried to process what we were seeing while trying to be quiet and be aware what was around us. After walking around as much as we could and taking a bunch of pictures we decided we better leave. We never made it up to the third floor. We assumed there wasn’t a set of stairs that was still intact. The building had a freight elevator but it looked like it wasn’t operable for years. We were super excited we found the building and were able to get in and look around. We had planned a trip to Niagara Falls in Canada just in case the motorcycle graveyard didn’t pan out. We hit the road mid afternoon and headed north. We took a slightly scenic route to Niagara Falls that would let us see the Lake Ontario. Little did we know the route we took led us right through the town of Newfane which we found out later is where the owner of all the motorcycles lives. We made it to Niagara Falls on the United States side and crossed the bridge over to the Canadian site. The Canadian side has a better view of the falls, better shops and amenities and it’s pretty much free if you are on a motorcycle and can find a place to park. Cars are usually forced to park in one of the main parking lots for $20. We parked in an area roped off with yellow caution tape for construction. Since it was Saturday afternoon there was no construction being done. After wondering around for a couple hours we made our way home via Queen Elizabeth Way in Canada which put us back in the United States at Buffalo New York. We continued south and stopped over for the night in Erie Pennsylvania. The next morning we rode the rest of the way home. It was nice weather and a pretty uneventful ride. We got home and we were still pretty excited about what we found but we settled back into our normal lives. We posted pictures and a short write up on dcsportbikes.net which is a forum for sport bike riders based in the Washington DC metro area and the site where the original post about the place was posted that got me hooked. The interest of the motorcycles quickly transformed into finding out the history and how to get our hand on some of the bikes. We had little to go on. We did a few internet searches. We found some clues and a name or two but nothing set in stone that we could find in the beginning. My buddy Phil has a friend in the Commercial/Industrial Real Estate business and called in a favor to find out about the building where the motorcycles were. His friend came through with some interesting information. Through Phil’s friend we found out the building was condemned and owned by the city of Lockport. The city assumed ownership after property taxes weren’t paid for many years. Phil somehow tracked down the owner’s name and phone number. Phil jumped the gun and called the owner whose name is Frank. Frank told him he wasn’t allowed in the building yet because the city wanted him to have accident insurance on the building before entering. Typical city government red tape slowed the process to a crawl. Frank told Phil that he would call him when he was able to get in the building. This wasn’t good enough for me. I didn’t want the motorcycles to slip away because Frank forgot to call Phil so I called Frank and tried to gain his trust. The process was slow and I would call Frank every three to four days and inquire about the status of entry. I probably got on Frank’s nerves but I knew it would be worth it in the end. Frank was very patient with me and always gave me an update when I called. While trying to win Frank’s trust I asked about the history of the building and the motorcycles and this is what I remember Frank telling me. The motorcycles were collected by a guy named Kohl. He owned several different motorcycle shops over 50 years and by all accounts a motorcycle enthusiast. Kohl would take trade-ins of motorcycles and would also buy inventory of defunct dealerships. In the 1960’s cheap Japanese motorcycles became incredibly popular and dealerships sprouted up everywhere. It was easy back then to start a dealer compared to today. Dealers were small and plentiful. I am not sure when Kohl purchased the building but I would guess it was in the early 1970’s. In 1997 I believe Kohl sold the building and motorcycles to Frank. Frank operated the business as Kohl’s Cycle Salvage which sold parts off of the hundreds of motorcycles he had. Back taxes were owed on the building and Frank began paying them. In 2002 Kohl died at 80 years of age. The building began to fall apart and crumble around itself. At one time Frank got an estimate to have the roof replaced. The estimate was $300,000, far more than Frank could justify. With the dilapidating conditions the City of Lockport condemned the building baring anyone from entering. The building and motorcycles sat for months. Frank didn’t even go in the building for 16 months prior to September 2010. Kids broke the lock on the back door of the place and began breaking stuff, moving stuff around and spray painting areas in the building. As the building continued to fall apart and the city condemning the building, Frank didn’t see a reason to continue to pay the back taxes. The city also assumed ownership of all of the contents of the building when they took ownership of the actual building. Frank successfully sued the City of Lockport for ownership right to the contents of the building. The building was still condemned and owned by the City of Lockport which wasn’t interested in letting Frank into the building. The city finally gave Frank a deadline to get whatever he wanted out by mid November 2010. It just happened that our reconnaissance trip up there in mid September and tracking down the owner was very close to the time Frank needed to get rid of the motorcycles. The end of September was fast approaching and we were hoping we would be allowed to come up over the Labor Day weekend so we wouldn’t have to skip a day of work. This didn’t pan out so we were just waiting to hear from frank. I was pretty sure we were going to be allowed into the building Saturday Oct 16, so a couple friends who were interested in going took the day off work and waited for Frank’s call. As the day went by we didn’t hear from him, I called him a few times and annoyed his wife. Our hopes of leaving Friday seemed dashed. Around 6pm Friday evening I got a call from Frank. He said the earliest we could get in the building is Sunday, October 17. I said ok but called Frank back and asked if there was any way we could get in the building Saturday. Frank said he had some errands to run Saturday morning but we could probably get in Saturday afternoon. I said great, see you tomorrow and called my friends who were impatiently waiting for word on the trip we have all been dying to make for weeks. We gathered our gear, flashlights, rope, cameras and anything else we thought we would need and headed North in my friend’s truck. We also had his small motorcycle trailer behind us. We left my house in Northern Virginia at 9pm, far later than we had originally hoped. The plan was to drive as far as we could and then stop for the night, and then continue onto Lockport in the morning. We just kept driving and got to a motel in Lockport at 4am. In the truck we had James (the owner of the truck), his neighbor Brent who James told the story to the night before while drinking, Salva – the guy who went with me the first time and me, of course. Turns out Dutch, a friend of ours and Associate Editor of Iron Horse magazine was in Orange County New York interviewing a famous bike builder with his own TV show. After the interview he drove five hours to Lockport and got a room in the same motel we were in. He got there much earlier than we did. We woke up early after a night of little sleep. Grabbed some food at the very nice continental hot breakfast at the motel and talked about the plan for the day. We weren’t scheduled to meet with Frank until around 12 noon. We left the motel and headed down to the area of Lockport where the canal lock was. Salva and I had seen the lock in action last time we were here but it was new to the other guys. We took some pictures and wondered around. As the time inched closer to noon the guys were getting antsy. After Frank called me we went over to the building and parked out front of the large garage door. Frank didn’t waste any time. He asked me to enter the code in the padlock because without his glasses he couldn’t see the small numbers. I entered the code, popped the lock and helped frank lift up the door. The 72 year old Frank is sharp as a whistle and was willing and able to help us load our scores. We spent the next 6 hours in the building exploring every square inch of the four levels. The first time Salva and I were in the building we didn’t know there was a stair case in the North West corner of the building. The stairs are in the back of the office area and lead to the huge third floor and a small forth floor. The third floor is the size of the main building. 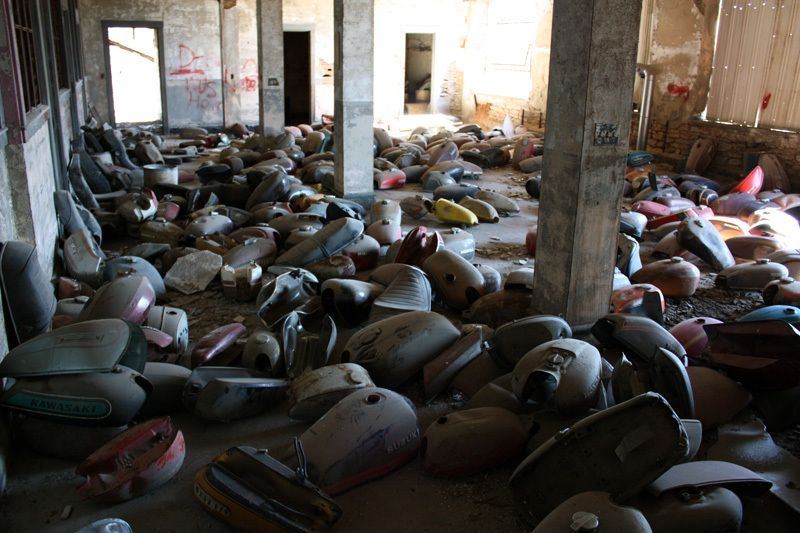 Once you go up the stairs you come to a large room that is full of mostly new old stock mufflers. Mufflers and pipes are everywhere and most are in great condition. Following the narrow path through the mufflers and pipes leads you to a door way and through that door way is a massive open area with motorcycles and parts everywhere. The floor had massive holes in it where the flooring caved in and crashed to the level below. The building’s content is massively overwhelming. It’s just a lot to take in; especially when you are trying to pick what treasures you want to take home. We claimed bikes and parts and gathered them up and talked to Frank about prices. The prices were very good which made us happy and allowed us to get more stuff. We loaded our scores up, thanked Frank and hit the road. We left Lockport right at 6:30pm Saturday night and headed south. We drove all night and got home around 3am. While we were there Frank told Dutch that in a few days he is going to start scrapping motorcycles. I don’t know if I didn’t hear this or thought he said a few weeks but a few days later a friend named Brian, who didn’t get to go with us the first time called Frank and inquired about coming up there and buying some stuff. Frank told him if you are going to come you better come now because he was loading bikes into dumpsters to be scrapped. So four days after I got back from Lockport I was heading back. I borrowed James’ truck and Brian borrowed a friend’s enclosed trailer and we headed to Lockport. We left the northern Virginia area at 11pm Wednesday night and drove all night and got to Lockport at 7:15am the next morning. We were planning to meet with Frank at 8am. We got to the building a few minutes before Frank did and we were surprised to see two large roll off dumpsters full of motorcycles sitting next to the west wall of the building. The bikes in the dumpster were mostly late 1970’s and early 1980’s bikes, which aren’t really to my liking but it was sad to see them just tossed into the large coffins waiting to be transported to the scrap yard. Frank arrived shortly thereafter and opened the door for us. There had been others who came and bought some bikes but the bikes I was eying were still there. We spent the next 4 hours or so running around and gathering parts and bikes that we wanted. I purchased three motorcycles and a huge pile of parts this trip. The three bikes were for friends that came with me last time but for some reason didn’t get them then. Brian bought five bikes and a large pile of parts. We jammed all the stuff into the truck and trailer, thanked Frank and hit the road. We drove all night again and got home around 1am or so. I didn’t make it to work that morning. I spread all my treasures out again and tried to figure out what I had. I picked up a bunch of new old stock Yamaha parts that I found in the far back corner of the third floor. The second trip was well worth it. To have the opportunity so few people had of picking through the building was great. We were able to save some bikes and parts. It was also nice to see the memories come back to Frank. He has a great memory and told us details from back when the business was booming including the time he scrapped 600 or so motorcycles years ago. I shed a tear hearing that. These weren’t ugly late 1970s or 1980s bikes. These were 1960s and early 1970s bikes. I’m afraid there will never be another scrap yard like this one. These days it’s much different. Motorcycles are much more expensive and not just tossed aside. With things like ebay and craigslist there are just too many avenues to sell bikes and parts. I’m glad we had the opportunity to meet Frank and have full access to the building. These finds are what we dream of as kids. We all hear the rumors but assume they don’t exist or don’t make the effort to explore the possibility or to track down the facts. This is one time where the outcome made it all worth it. I called Frank on November 24 2010 just to see how the clearing out of the building went. He told me all of the bikes have been removed and the building has been turned over to the City of Lockport. I asked him what he thought would happen to the building. He said “knowing the City of Lockport it will probably sit there until it falls in on itself”. It’s the end of multi decade love affair with motorcycles. Kohl started it, Frank finished it. The famous New York motorcycle graveyard did exist, but it’s now gone forever. The building burned Tuesday, July 30th, 2013. I haven't done an update on that but I need to. It�s six years after I went to Lockport and bought a few bikes and parts. I�m more educated on motorcycles now and have more money so I wish I could go back and do it all over again. When we were there I bought unusual bikes because they looked neat. If I could do it over I would have bought everything that had a Honda badge on it. The �what�s it� bike I bought turned out to be a customized NSU made in Germany. It looks like it was a street bike someone turned into a trail bike. I sold that to a guy in Maryland who collects German motorcycles and other stuff. The two Jawas were sold to a guy in southern Virginia. My friend James still has the Bridgestone motorcycle he bought, but he hasn�t done much with it. He�s moved on to bigger toys like a side by side and a toy hauler camper. He and his wife also had a baby that keeps them busy. Salva was the guy who went with me on the original scouting trip and he went with us on the second trip as well. He get the green Honda CB350 which turned out to be the best purchase. He wanted a CB350 since I finished my CB350 bobber shortly before this. It sat for a while and then we started building it. We got it finished just a couple days before we took it to the Tail of the Dragon for a motorcycle weekend in 2013. The bike sites in Salva�s garage now, not running. Salva got married as well and his wife recently had a baby girl. The days of spending hours a day in the garage with your friends messing with motorcycles seems to be over. I got a lot more parts there than are pictured. I got a bunch of NOS Yamaha parts still in the wrappers. I kept this stuff for a few years and then sold it to a guy named Pat. I met Pat at the White Rose Motorcycle Swap Meet in Spring Grove, PA held every year in mid-August. Pat is a super nice guy who has all the qualities you want in a motorcycle loving friend. 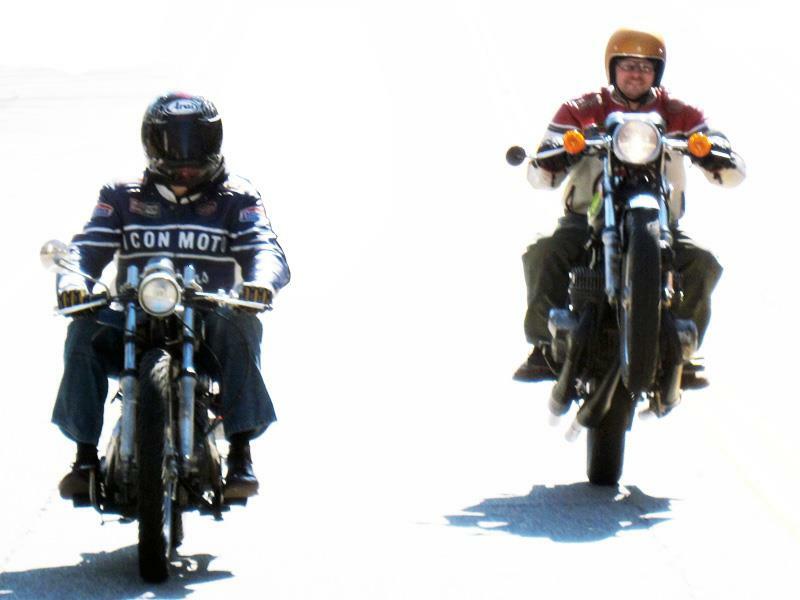 We both went to Vintage Motorcycle Days at Mid-Ohio Motorsports Park in Ohio this summer. It was Pat�s first time there. I rode my sport bike there in the summer of 2010, just a few months before this story took place. For the third and final trip I went with a guy named Brian but we call him Dickii (he's doing the wheelie in this picture). I didn�t know him at all before that trip. He was a member of the sport bike forum where we originally talked about this place and he said he wanted to go. It was a little odd driving nine hours in the middle of the night with someone you don�t know but we had a great time. After this we became good friends and did even more motorcycle adventures and remain friends and still go to motorcycle events. I haven�t been back since even though Salva and I talked about taking a trip back to look around some more and to see what was left. I�m pretty sure there was still thousands of parts still in the building when it was set on fire. I�m sure Frank didn�t scrap them all. Some were hard or very dangerous to get to and some just didn�t weigh enough to make it worth it. I haven�t talked to Frank since that call I placed to him on Nov. 24th, 2010. I hope he�s still out there kicking around, enjoying life. At the end of the original write up I said there won�t be another hoard like this found. Well, I was wrong. There was a guy named Peter J. Starzyk in Chicopee, MA. It wasn�t as big as the Lockport find but it was very large. I got access to it very late, after hundreds of motorcycles had already been removed. I went there in the summer of 2016 and bought a ton of parts and a few motorcycles. I wish I got into it early but it didn�t work out that way. I�ll put some pictures together soon. Unfortunately, pictures of it before it was disturbed don�t exist that I know of.